The cancellation of one’s gym membership requires a formal process to be carried out. The first step towards this process is to inform the gym’s in charge or manager that you wish to quit. 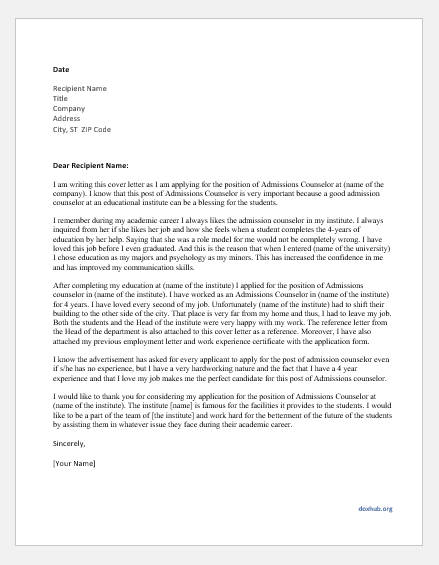 In order to do so, a formal letter is written to the concerned person. 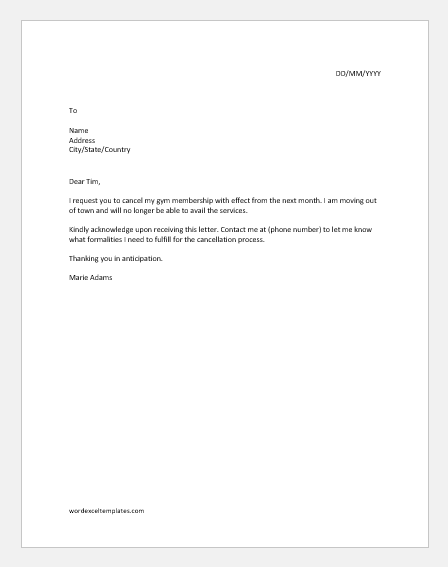 It is a brief letter which states your request for membership cancellation. Additionally, you may also mention the reason for leaving. Usually, a person requests for his gym membership cancellation when he is moving away, has some engaging personal commitments or is suffering from a certain health condition that requires staying away from strenuous physical activity. While writing this letter, the following points can help. It is a formal and short letter that needs to be comprehensive and precise. Use the opening lines to state your purpose for writing. Additionally, you should also be specific by stating exactly when you need the cancellation to take place. 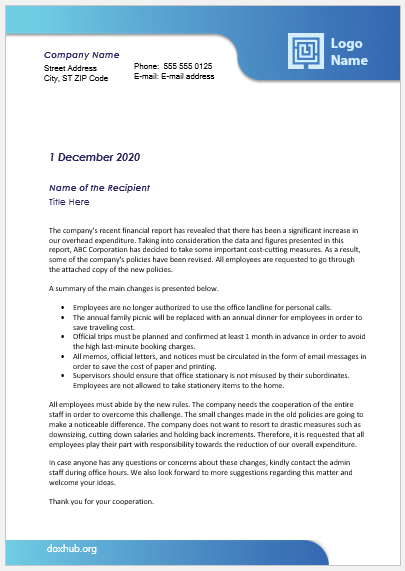 In most cases, there is a notice period specified in the membership contract. Therefore, you should write the letter keeping in mind the duration of this period. On the other hand, you may also request immediate cancellation according to the cause of quitting gym, such as poor health. In case of a personal reason, you are not obliged to explain why you wish to cancel your membership. However, in other cases, it is polite to mention the reason. Moreover, if you are leaving due to unsatisfying services, stating the reason will let the gym’s management know about its shortcomings for future improvement. 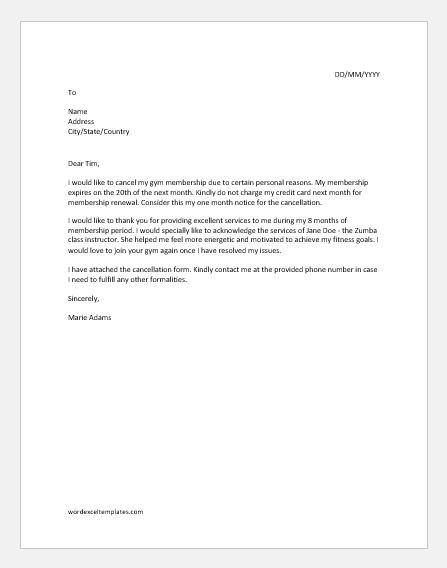 Another courteous gesture is to use a few words to thank the gym’s management for its services. You may even mention the names of staff members who served you well during your gym sessions. Furthermore, you may also show interest in joining back once the circumstances allow you to. When you sign up for a gym’s membership, you enter a contract which contains certain rules. Every member is required to adhere to these rules even for the cancellation process. For instance, according to some contracts, you may not be allowed to request for cancellation unless you notify a month or so prior to the requested cancellation. Do mention in your letter that you have fulfilled this condition. On the other hand, in case you need immediate cancellation, refer to the part of the contract that allows you to do so. For instance, if the gym fails to provide you the services promised in the contract, you can ask for early cancellation. End the letter on a friendly note. Moreover, ask the management to contact you for further details or formalities. Contact details should be shared at the end of the letter. I would like to cancel my gym membership due to certain personal reasons. My membership expires on the 20th of the next month. 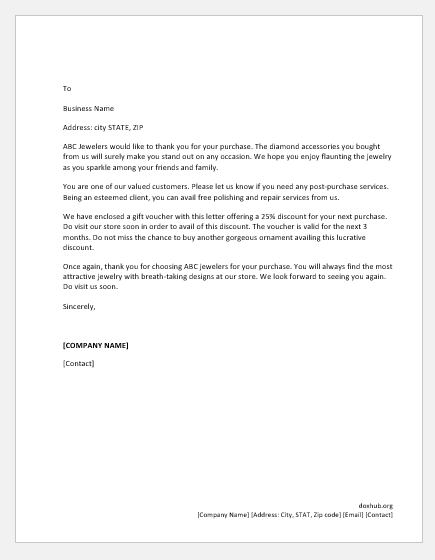 Kindly do not charge my credit card next month for membership renewal. Consider this my one month notice for the cancellation. I would like to thank you for providing excellent services to me during my 8 months of membership period. I would specially like to acknowledge the services of Jane Doe – the zumba class instructor. She helped me feel more energetic and motivated to achieve my fitness goals. I would love to join your gym again once I have resolved my issues. 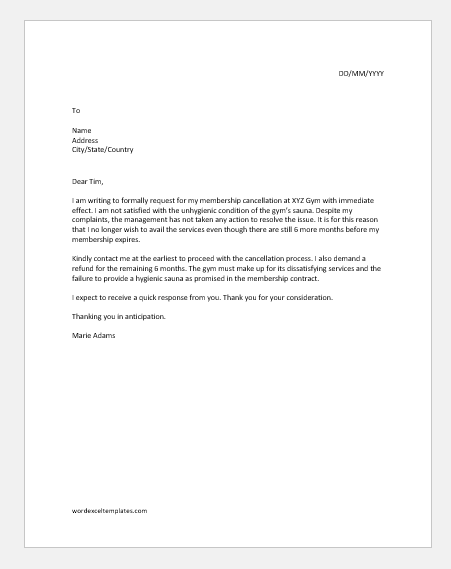 I have attached the cancellation form. Kindly contact me at the provided phone number in case I need to fulfill any other formalities. I request you to cancel my gym membership with effect from the next month. I am moving out of town and will no longer be able to avail the services. Kindly acknowledge upon receiving this letter. Contact me at (phone number) to let me know what formalities I need to fulfill for the cancellation process. I am writing to formally request for my membership cancellation at XYZ Gym with immediate effect. I am not satisfied with the unhygienic condition of the gym’s sauna. Despite my complaints, the management has not taken any action to resolve the issue. It is for this reason that I no longer wish to avail the services even though there are still 6 more months before my membership expires. Kindly contact me at the earliest to proceed with the cancellation process. I also demand a refund for the remaining 6 months. The gym must make up for its dissatisfying services and the failure to provide a hygienic sauna as promised in the membership contract. I expect to receive a quick response from you. Thank you for your consideration.